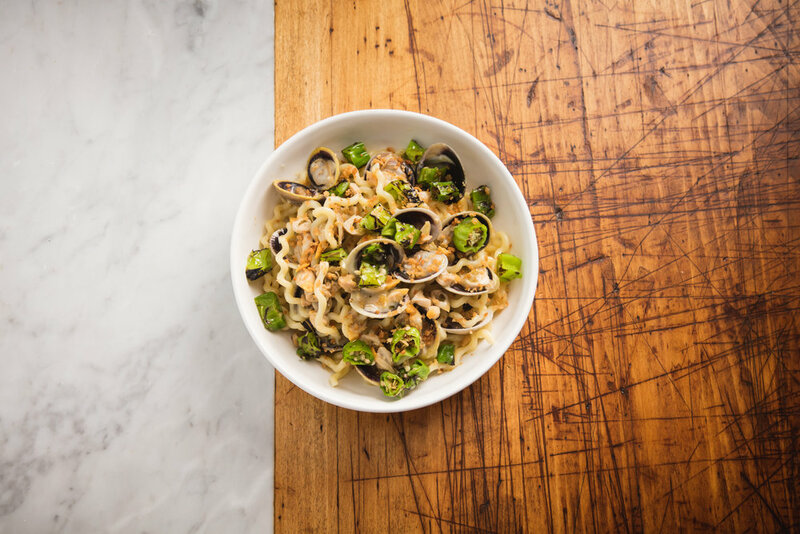 Pammy’s is a New American restaurant inspired by the feel of an Italian neighborhood trattoria. Perched between Cambridge’s Central and Harvard Squares, Pammy’s is a cozy yet sophisticated neighborhood destination. For husband and wife team Chris and Pam Willis, who live right up the street, Pammy’s is an extension of their living room. They’ve brought together their love of great food, easy hospitality and chic vibe to create a lively space that is welcoming to all looking for a memorable meal. With dishes that lean heavily on Italian flavors but are not restricted by any rules of the cuisine, the food is unpretentious and delicious. As the kitchen pulls from Italian culture and American innovation, the wine list also juxtaposes New and Old World wines from small vineyards in both countries. A dual-opening fireplace wrapped in white ceramic, an oversized salvaged communal table designed for side-by-side dining and rich leather banquets are just some of the design elements that make up Pammy’s charm. Chris Willis was going to be a drummer. Pam had her sights set on acting. But deep down, it was always their fate to open a restaurant. Chris’ life has been surrounded by food - growing it, cultivating it, cooking it - even from his early days on his family’s fourth-generation farm. There, he was inspired to appreciate the nuances of produce and discover the delicate seasonality of flavors. Hospitality is in Pam’s blood. The daughter of a hotelier and a restaurateur, Pam lived in New York City hotels when she was a young girl, finding herself often left with cooks and busboys as babysitters. She spent hours with Maître D’s after school, folding napkins and steaming silverware. Chris built his impressive resume across many fine establishments, but attributes his career to five impactful experiences: the fundamentals of cooking at Rialto; discipline at Clio; balance, texture and spice at Cafe Gray; how to cook pasta at Sfoglia; and the importance of maximum flavor impact at ABC Cocina. The combination of all of these things is what makes Chris the chef he is today. In defining his approach to food at Pammy’s, Chris believes in power of simplicity. Showcase just a few star ingredients in a dish and allow the care, knowledge and skill to shine through. 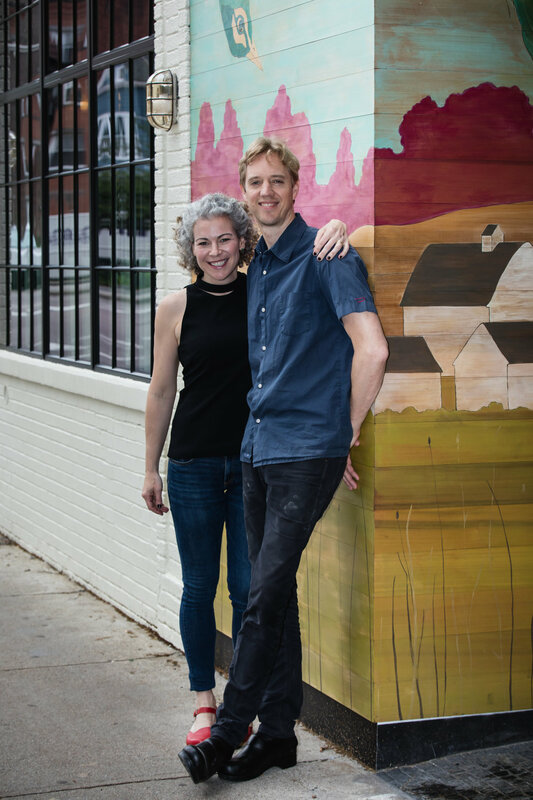 Together, Chris and Pam’s goal is to serve unfussy, great food and channel their natural knack for hospitality. While studying at Massachusetts College of Art and Design, Lauren began working restaurant jobs to pay for school. It was there that she discovered a knack for hospitality and wine that eventually lead to a home behind the bar. Her passion grew from curious bartender to Beverage Director at Ten Tables in Jamaica Plain. At Pammy’s, Lauren’s wine list is made exclusively of natural wines from growers and makers who embody the restaurant’s ideals of quality, care and compassion. At the start of his career, Rich left his hometown of Providence, RI, to explore Boston, New York City, and Los Angeles and quickly discovered a passion for cocktails. While in California, Rich opened Soho House in West Hollywood, Big Bar in Los Feliz and Harvard & Stone in Los Angeles. He created the bar program for Areal in Santa Monica and was a consultant for The Edison in downtown LA. His talent did not go unrecognized and led him to opportunities such as being a brand ambassador for Tequila Ocho, Kubler Absinth and Right Gin. A desire to return to his New England roots brought Rich and his wife (a fellow bartender) back to Boston, where he is the bar manager of Pammy’s. While not afraid of a bitter brown and boozy cocktail, Rich’s creations bring a culinary approach to the bar and appreciate ingredients that reflect the season and compliment the food menu. A New England native, Mike Distefano has honed his culinary skills over the past decade while working alongside some of the greatest talents up and down the East Coast. Working under Chef Michael Lascola at American Seasons on Nantucket, Mike developed a passion for nose-to-tail cooking and incorporates this whole animal philosophy in his style of cooking today. Mike journeyed south to Charleston to join Chefs Josh Keeler and Nate Whiting at 492, a sophisticated eatery on historic Upper King Street. A chance to work under Chef Michael Paglarini brought Mike back to the Northeast, where he cooked elevated Italian cuisine at the highly regarded Giulia and Benedetto.